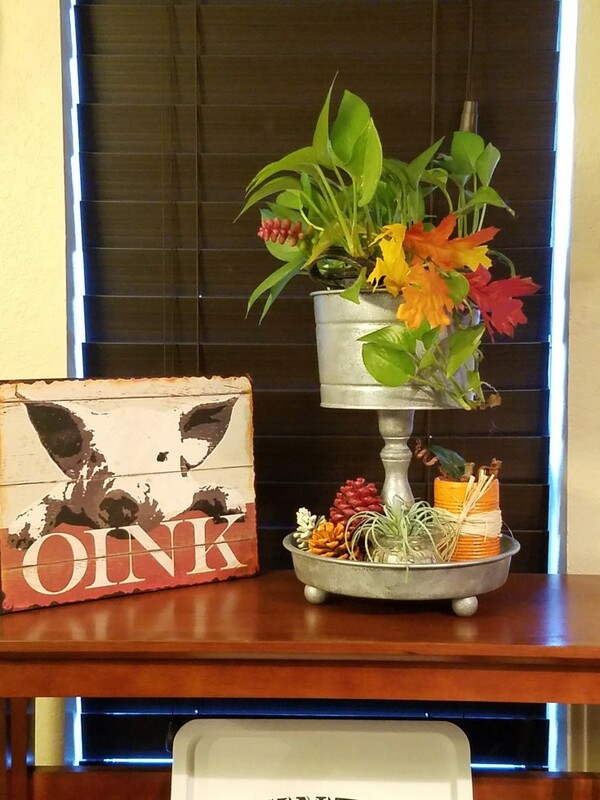 I’ve been looking through my thrifty stash again trying to clear out more things, and I came up with this two-tier faux galvanized tray. 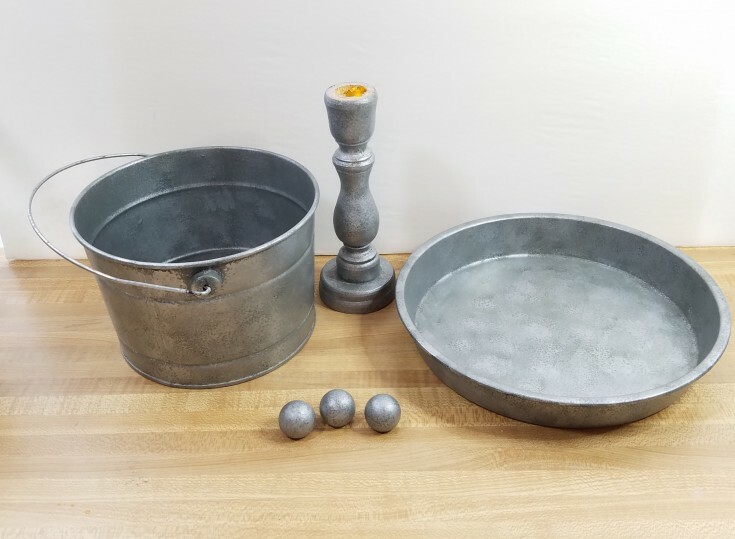 Made out of a metal bucket, baking pan, candlestick, and wooden ball knobs. Wanting it to all look like galvanized I decided to try a faux galvanized metal technique again. 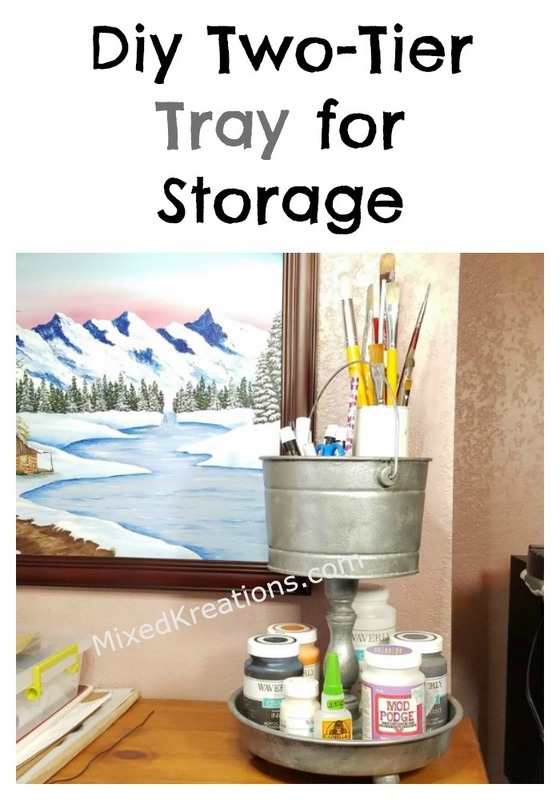 Like on one of my Dollar store container makeover and my Faux galvanized metal letters. I wasn’t sure how it would all turn out but I’m happy to say it all went well! 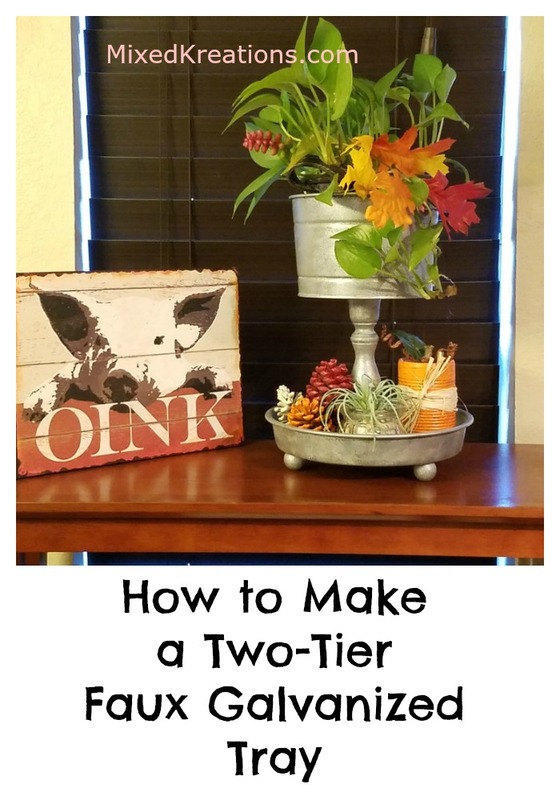 To make my two-tier tray I started out painting everything with Waverly grey chalk paint. 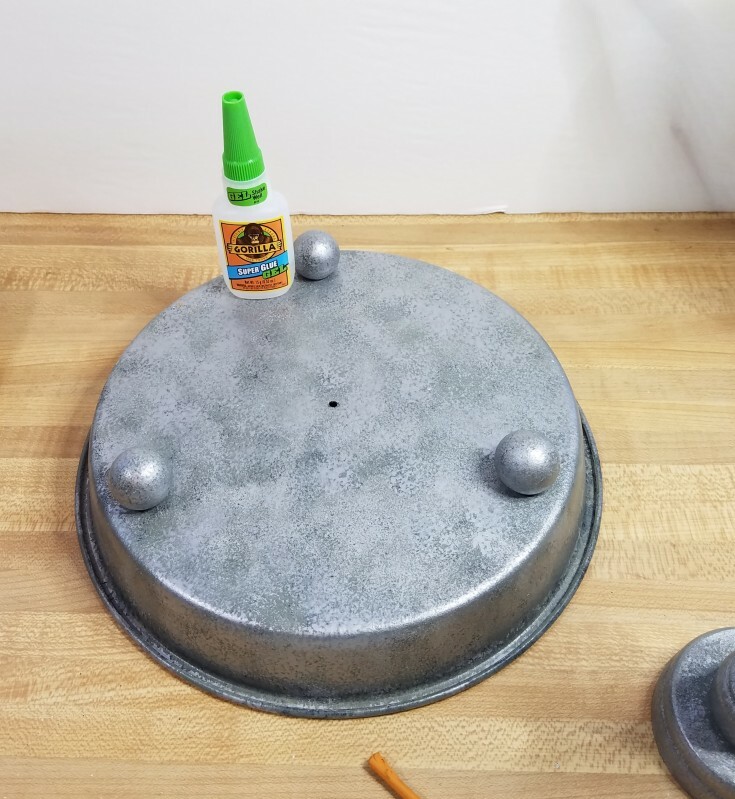 I used chalk paint because it adheres to metal without having to sand the items. I only added one coat since I would be layering it with different colors of paint. 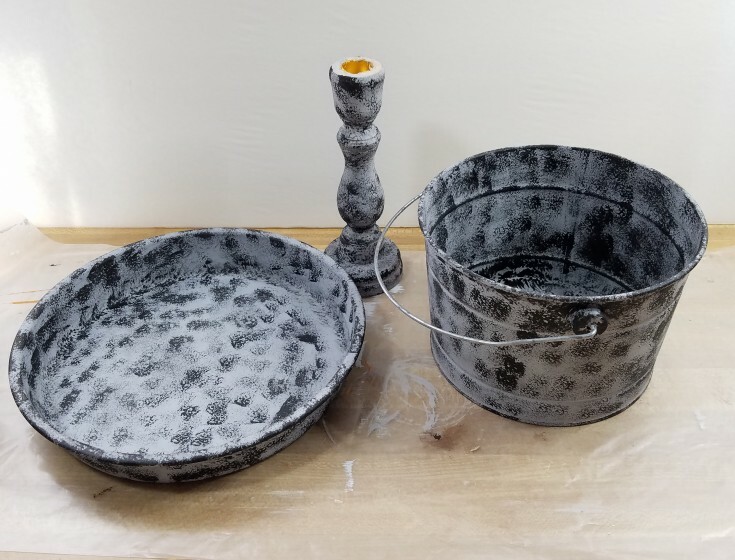 Next, I used black acrylic paint and a sponge to dab the black on over the grey leaving black spots here and there. 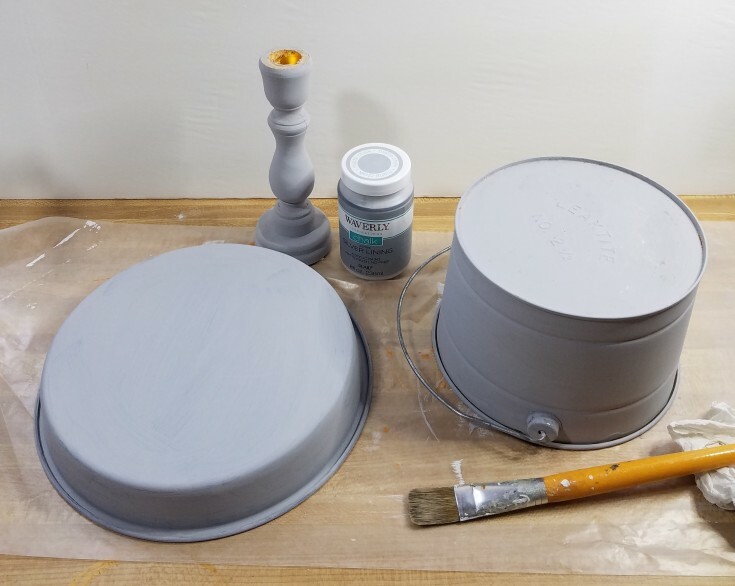 Then I went back over the tiered tray using rainy day grey to tone down the black and add a variety of grey’s. 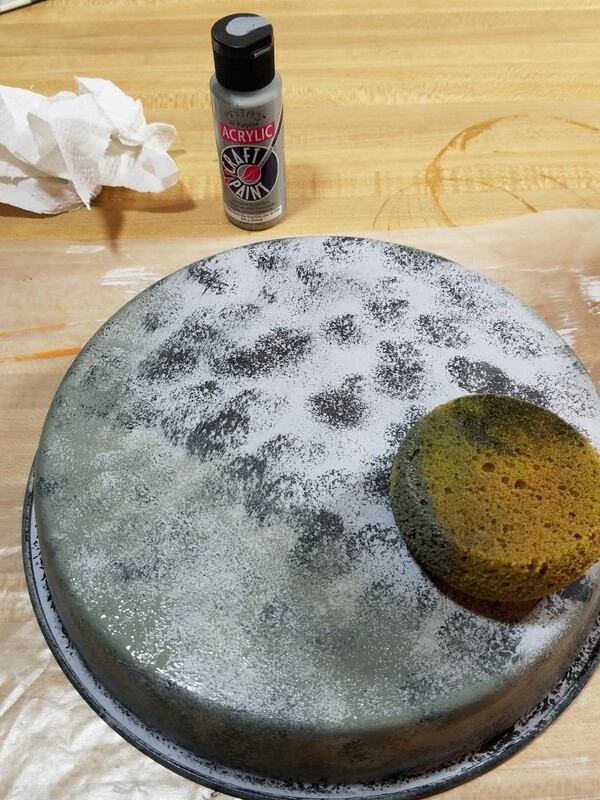 Once all this is dry I went back over everything with metallic using the sponge again and a paintbrush where the sponge couldn’t reach. 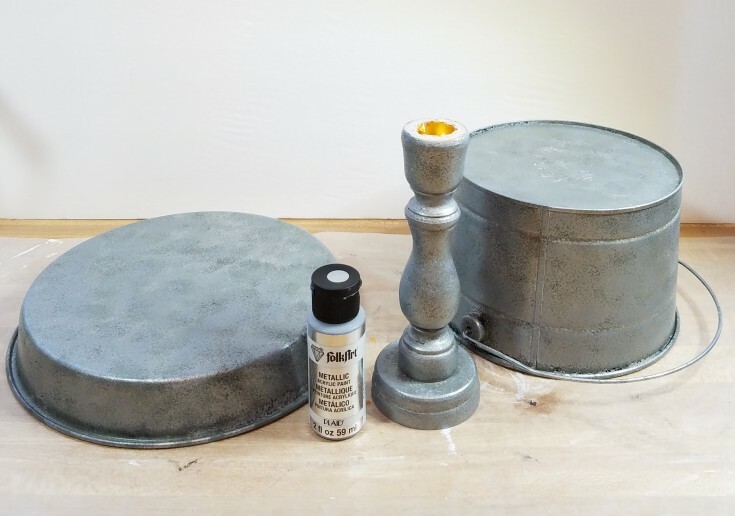 I continue sponging the metallic on the two-tier faux galvanized tray until I got the desired effect I was looking for. 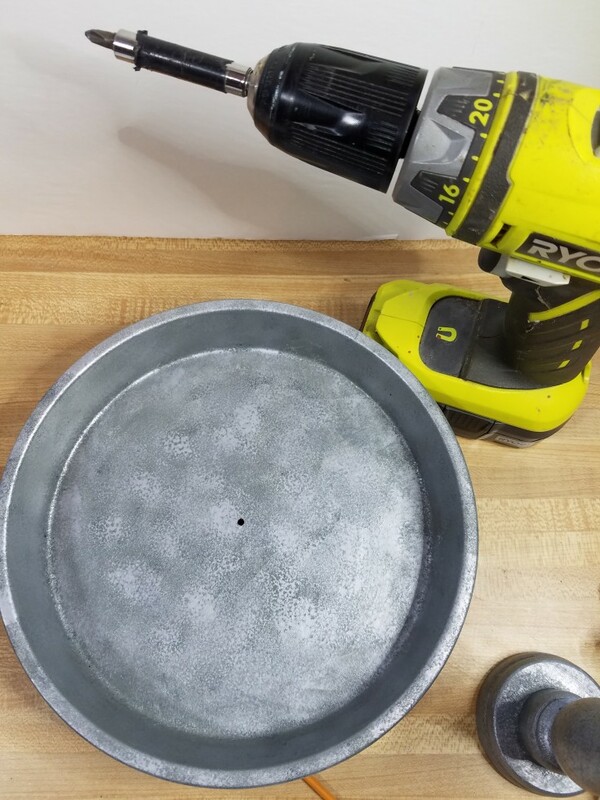 Next, I drilled a hole in the center of the pan and bucket to help secure them to the candlestick. 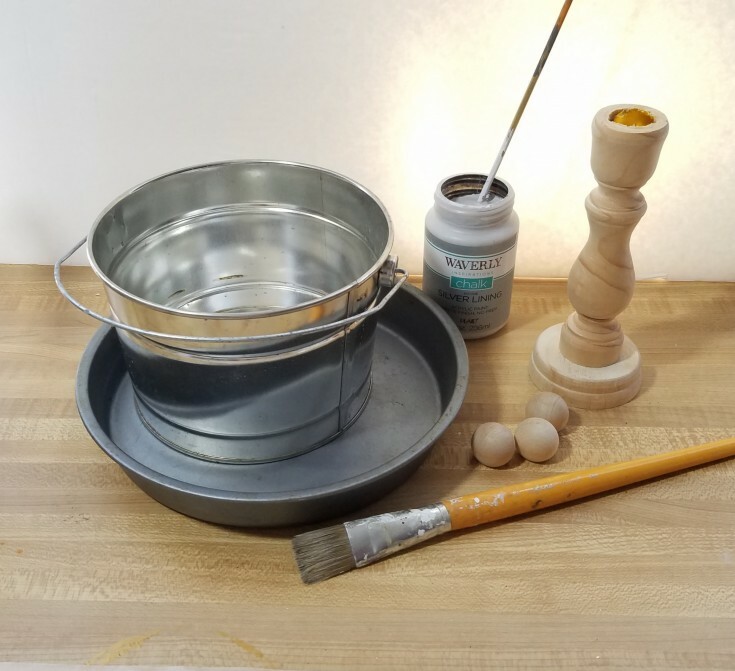 Then I used Gorilla super glue gel to connect the ball knobs to the bottom of the pan letting set for a few hours to dry. 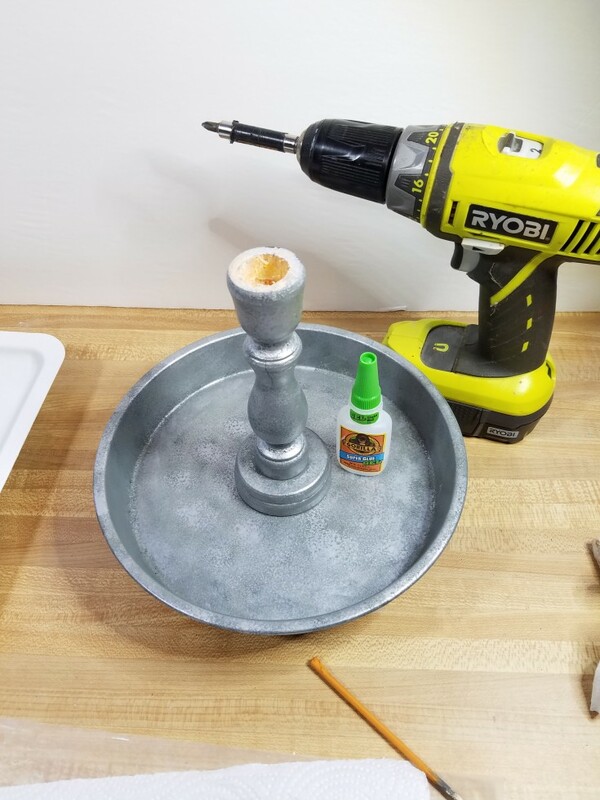 To put it all together I added some glue to the Candlestick and put it in place then screwed the pan and bucket down. 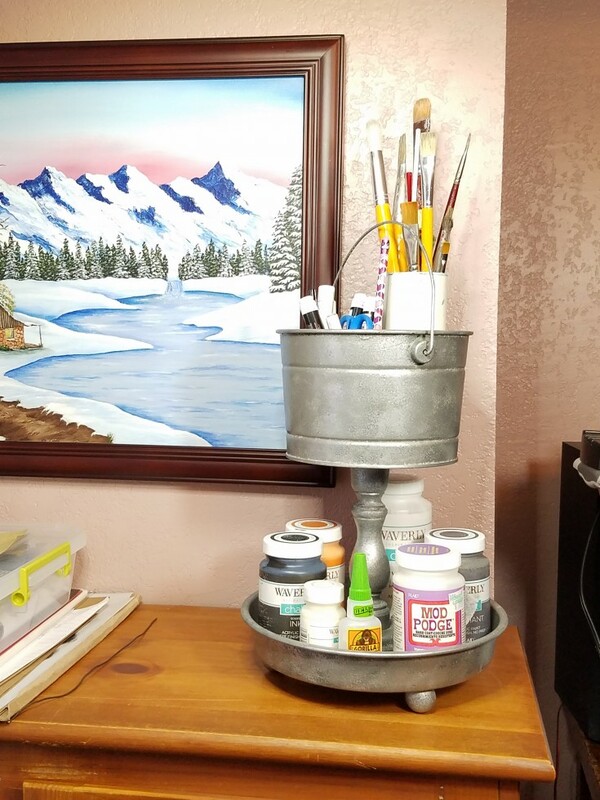 That was a pretty easy project I was able to use up a few more items from my stash and now have a two-tier faux galvanized tray. I’m thrilled how it turned out! 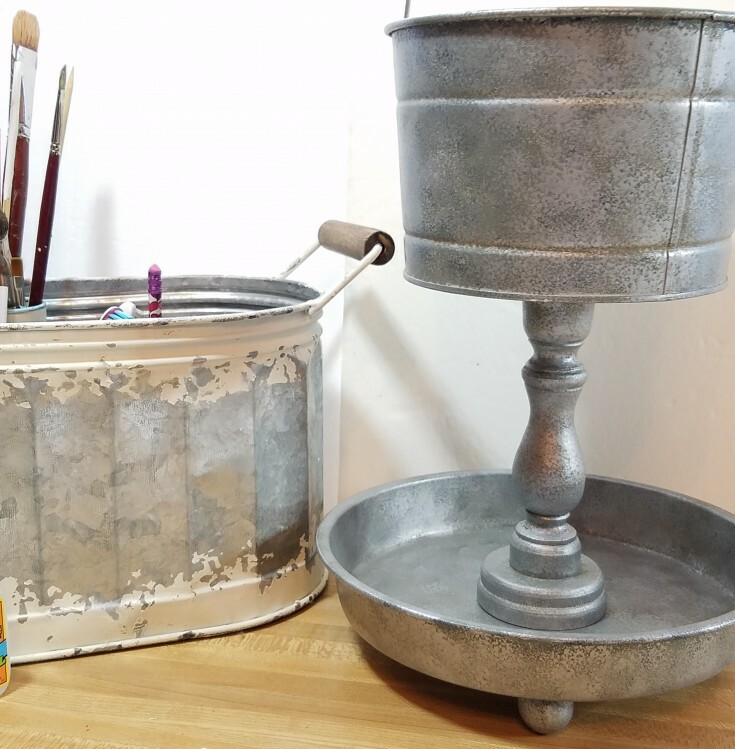 Hmm now where to use it, craft room, bathroom…..
Here’s my two-tiered tray beside a galvanized tub. 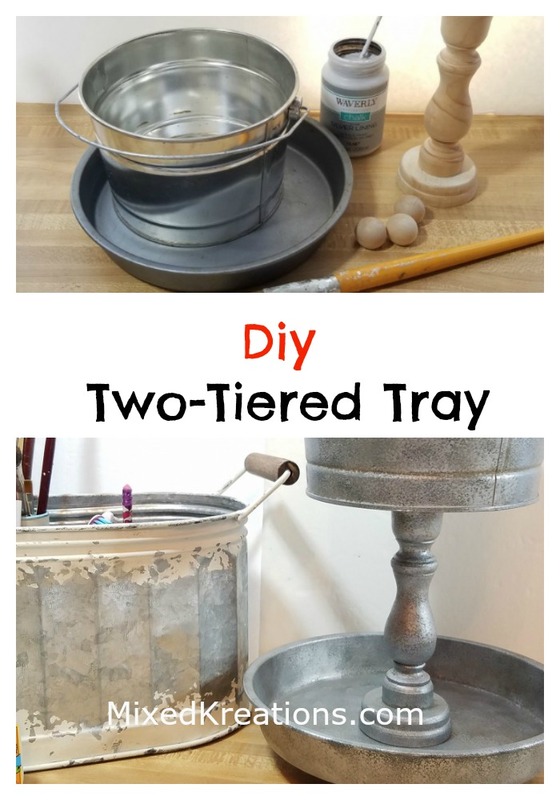 How do you like my two-tiered galvanized tray, and do you think it resembles galvanized metal? 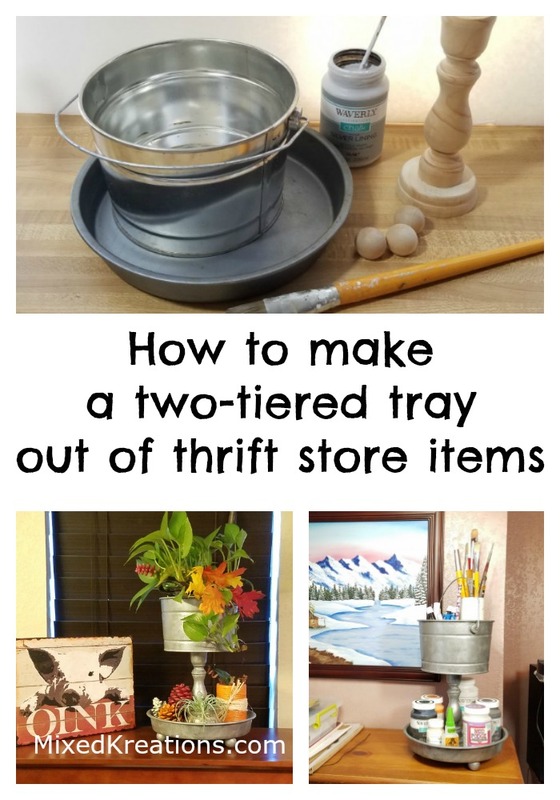 More Diy Trays You May Enjoy! 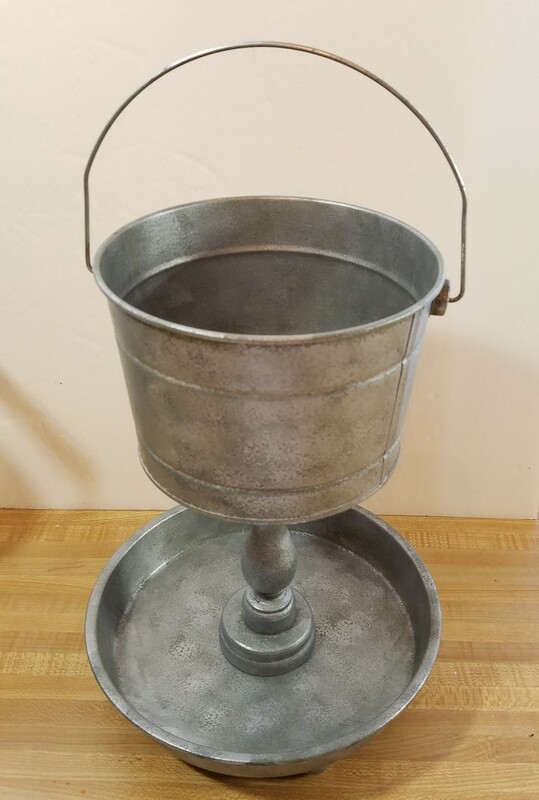 It does look like galvanized metal! I like how it all looks so uniform now, & the ball feet are also a good addition. I need one of these! Thank you Florence! I’m glad that I chose the ball knobs over the blocks. I could use a couple more of these. Guess I need to go thrifting some more. Thank you Michelle! 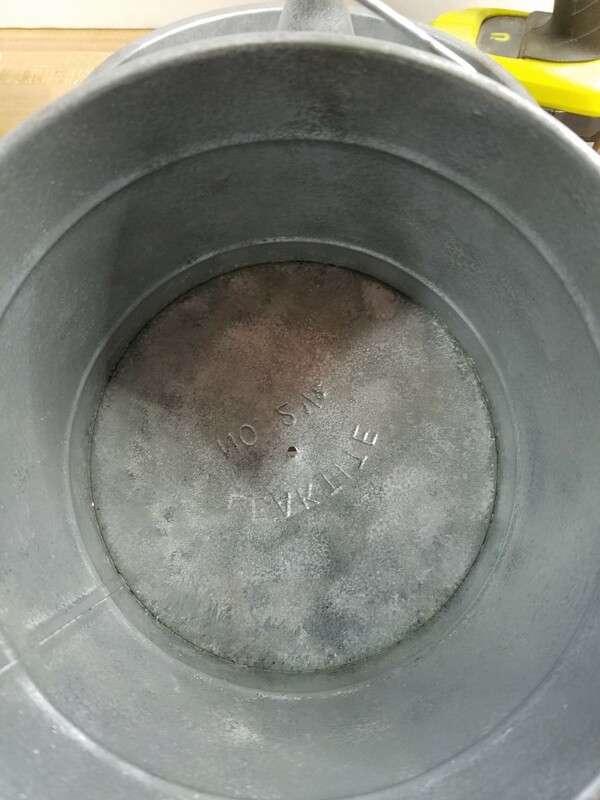 It even tricked a metal worker He thought that it was galvanized metal just looking at it. I’m sure he would of known if he had picked it up. Now I need to make a couple more.